If you wish to 'try your hand' at making rosaries, seek a gift for a special event (or sacrament), or if you have a group or school project, these kits make good starting points. 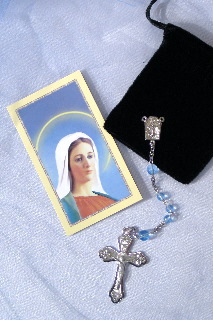 We also have an array of special kits each carefully designed by our own rosary makers and staff. If you already have tools or want to make any changes to the kits, click 'edit' to modify the kit contents (not all kits can be modified). Cord kits are typically suitable for anyone age 8 or above (children may need some adult help). 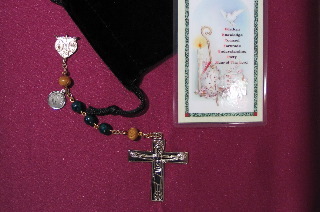 Chain and flexwire rosaries can usually be made by those age 13 and over. Some children will require adult assistance while making cord, chain or flexwire rosaries. All kits come with assembly and praying instructions. These kits are merely recommendations. You can make literally billions of different, unique rosary designs from our inventory. Click here to design a kit from scratch. Colorful Children's Wood and Cord Rosary: Brightly-colored non-toxic beads, cord, center and instructions for making a young-child's rosary. Wood Bead and Cord Rosary: Quality wood beads, cord, metal center and crucifix. Tools and instructions included. Makes a great, long-lasting rosary. Black Onyx and Silver Plate Chain Rosary: Contains all parts, instructions and tools to make a traditional chain rosary with attractive black onyx beads, silver plate chain and silver plate crucifix and center. Suitable for ages 13 and up. Rose Quartz and Silver Plate Chain Rosary: Designed by one of our customers, this attractive kit contains all parts, instructions and tools to make an attractive rose quartz chain rosary. Suitable for ages 13 and up. Stone Beads and Flexwire Rosary: A great starting point for anyone wanting to try making a flexwire rosary. 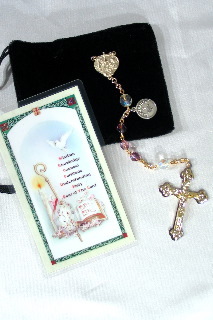 This kit contains all parts, tools and clear instructions for making a flexwire rosary. Suitable for ages 13 and up. A Sacrament is a sign instituted by Christ that gives grace. The Church recognizes seven special events of this kind, including Baptism, Confirmation, the Eucharist, and Matrimony (in addition to Penance, Healing and Holy Orders). Boy's Baptism Rosary: Deep blue hearts, shimmery clear glass beads, and a baptism medal for the baby boy in your life. A small traditional crucifix is just the size for tiny fingers, and strong enough to withstand a little boy's first prayers. A black flocked pouch and baptismal holy card complete the gift. Girl's Baptism Rosary: Freshwater pearls, delicate pink hearts, and a baptism medal make this a treasured gift for the baby girl in your life. As she grows, her rosary will be strong enough to be handled with love during those first "Hail Marys". A white satin pouch and baptismal holy card make this a complete gift. Baptism Rosary: Mother of pearl and aqua beads symbolize the waters of the Sacrament. The Trinity crucifix symbolizes the Trinitarian nature of this (and every) Sacrament. Includes an additional baptism medal. The crucifix can be engraved with a date and initials. First Communion Rosary: Receiving Jesus, His own Body and Blood, for the first time is a life-changing experience. In prayer, a child continues to develop into the man or woman that God desires. This rosary is full of color to bring joy to a child's heart. The Divine Mercy center reads, "Jesus, I trust in you!" The chalice pendant will always bring to mind this holy day. 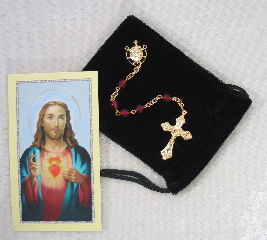 Gift includes a "How to Pray the Rosary Pamphlet", First Communion holy card and pouch. First Communion Rosary: The different, earthy jasper beads represent the body and blood (and soul and divinity) of the Savior. The center has an image of wheat and wine. The traditional crucifix can be engraved with a date and initials (click the edit link to add engraving). Men's Confirmation Rosary: The true gift of confirmation is grace - grace to fulfill our roles in the world and to become people fit for heaven. A habit of prayer will help our young men continue to live in grace. The combination center on this rosary includes the Holy Spirit dove, the Miraculous Medal, the Cross, the Sacred Heart, and St. Joseph - a family picture. 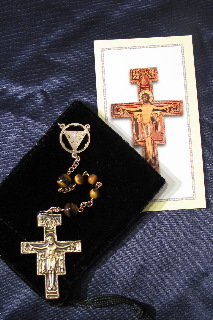 The Cursillo crucifix is inscribed on the back with the words, "Christ is Counting on You". Dark green fossil beads and fragrant sandalwood make this a handsome rosary. 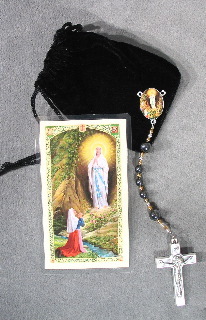 Includes directions for praying the rosary, a confirmation holy card and pouch. Women's Confirmation Rosary: The true gift of confirmation is grace - grace to fulfill our roles in the world and to become people fit for heaven. Young people need grace and assistance in developing a habit of prayer. It is our hope that the confirmation rosary will help them on the path. The combination center includes the Holy Spirit dove, the Miraculous Medal, the Cross, the Sacred Heart, and St. Joseph - a family picture. French crucifix and amethyst glass beads make a pretty rosary. 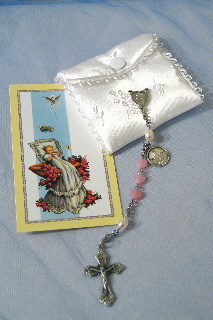 This set also includes directions for praying the rosary, a confirmation holy card and a pouch. Confirmation Rosary: The Sacrament of Confirmation celebrates the 'perfection' (completion) of the gifts of the Holy Spirit as begun in Baptism. The special emphasis upon the role of the Holy Spirit is symbolized by the Holy Spirit center and fire-red Our Father Beads. 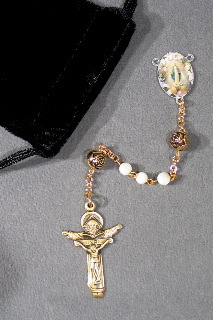 The rosary includes a special Confirmation medal that can be replaced by a patron saint medal of your choosing, and the crucifix can be engraved with initials and date. Wedding Rosary: Celebrates the Sacrament of Matrimony. A timeless classic, the 'lasso' or wedding rosary is two rosaries in one, reminding the couple of the importance of prayer together and their unity in Christ. This design consists of beautiful gold plated and gold filled components, complemented by mother of pearl beads. Remembrance Rosary: Though a funeral isn't a Sacrament, it is a powerful event, and so we have included it in this list. Made from roses that you provide, this rosary is a heirloom-quality keepsake for the family and friends of loved ones who have passed away. This is a common request following a funeral. More information on heirloom rose petal beads and related rosaries. All of these kits come in multiple packs, usually 10 or 25. By ordering these bulk kits you get to 'take advantage' of our bulk bead discount prices. Feel free to use or return excess materials for a pro-rated refund or credit. You can easily create similar kits with 3 500-bead bulk packs (1500 beads total), 25 crosses or crucifixes and about 150 or more feet of cord. One-Decade Children's Pocket Rosary: Colorful pony beads, mousetail cord, metal crucifix and holy medal with assembly instructions. No tools are needed. Great for younger children. Some adult assistance is necessary. Enough to make 10 chaplets. 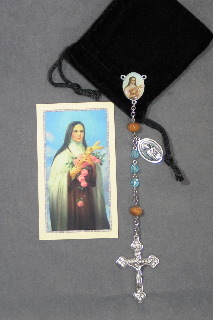 St. Therese Pull Beads: Colorful pony beads, mousetail cord, metal crucifix and holy medal with instructions. No tools are needed. Great for younger children. Some adult assistance is necessary for assembly. Similar to the one-decade pocket rosary, above, except that the beads slide on the cord. The tradition is to slide one bead for each good deed, attempting to have done at least 10 good deeds for others each day. Enough to make 10 chaplets. Wood Beads, Cord and Metal Crucifix/Center: An attractive, strong, long-lasting rosary. 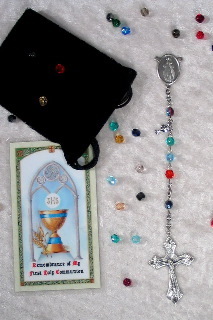 Kit includes all beads, tools, instructions and parts for 10 rosaries. The 8mm wood beads sometimes need to be cleared of burrs or debris using the end of a paperclip, tack, needle or small file. To our knowledge this is the least-expensive rosary of this quality available with a metal center and crucifix. Glow-in-the-Dark Beads, Cord, and Wood Cross: A cord rosary with fun, glow-in-the-dark beads and a wood cross. Can be assembled by most children eight years old or older. May require some adult assistance. 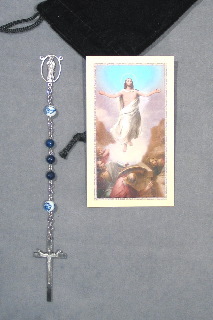 Includes all beads, tools, instructions and parts for 25 rosaries. Plastic Beads, Cord and Wood Cross: A very economical but sturdy kit for groups. Suitable for ages 8 and above. The 6mm faceted, translucent plastic beads are a variety of bright colors. Cord passes easily through the beads. Blessed Trinity Rosary: "In the name of the Father, and of the Son, and of the Holy Spirit." We make the sign of the cross and mark ourselves with this sign of the Trinity every time we pray. The unique crucifix on this rosary reminds us that God desires a relationship with us. He is Father, Savior, Counselor, and Giver of all good gifts. Your rosary or kit comes with a black leather pouch and Trinity holy card with the novena to the Most Holy Trinity on the back. Bouquet Rosary: When the rosary prayers are said, we are vocally adorning our Mother Mary with roses, hence the name "Rosary". Echoing the Scriptures, we proclaim her "full of grace" and "blessed among women" and heap roses of love upon the Mother of our Lord. This rosary would make an exquisite gift for the woman in your life whose mother-love makes you want to bring her roses. White satin pouch and gold-gilt holy card are included. Crown of Thorns Rosary: Meditating on the sufferings of Christ, this image sticks in our hearts and minds. Who has not been hurt, mocked, or tormented? But none have suffered like the Innocent Lamb of God. "But he was wounded for our transgressions, crushed for our iniquities; upon him was the punishment that made us whole, and by his bruises we are healed." Isaiah 53:5. A black pouch and holy card are included. Our Lady of Fatima Rosary: Francisco, Jacinta and Lucy were the three young Portuguese children bestowed with a difficult vision from Our Lady at Fatima. Mother Mary came to show them the reality of hell and the threat of godlessness in this age. A devotion to Our Lady of Fatima is marked by a great and fervent concern for souls in this world and the next. 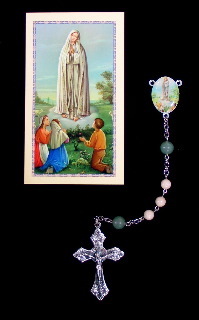 The Fatima rosary includes a full-color center and holy card with Our Lady and the three children, a traditional crucifix and a pouch. Our Lady of Grace: "Hail Mary, full of grace..." How many thousands of times have we called on the woman who, more than any other, allowed herself to be filled with God's life? Through her, God's grace flowed out upon the whole world. This rosary rejoices in the Lady of Grace with a beautiful full-color center, mother of pearl and gold-tone rosebud beads, and a Trinity crucifix. Black velvet pouch is included. Our Lady of Guadalupe Rosary: The amazing story is told of Juan Diego, a humble Indian peasant of Guadalupe, Mexico, to whom the "lady of heaven" appeared in 1531. To convince the local church authorities, Our Lady imprinted her own image (perhaps the most striking image we have of our Blessed Mother) on Juan Diego's garment. 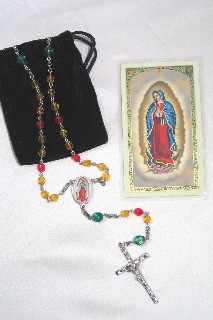 The colorful beads of this rosary are teamed with a Guadalupe center, a bold crucifix, a Guadalupe holy card and black pouch. The Habit Rosary: The rosary made with priests and religious in mind. 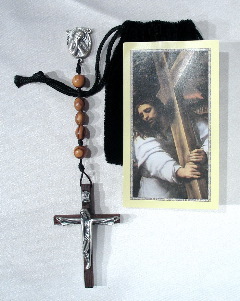 This is the epitome of traditon with a large (3-3/4 inches long) black wood crucifix, a miraculous center and heavy black onyx beads. Add bow connectors and you'll have a durable set of beads to last a lifetime or longer. Holy Cross Rosary: Olive wood beads from Bethlehem set this apart as a fine cord rosary. The large wood cross with a detailed corpus of Christ become tools of meditative prayer upon the passion of our Lord. Comes with a black flocked pouch and holy card. St. Joseph Rosary: Chosen by God to father the heavenly child, St. Joseph is also the patron of the universal Church. Pope Leo XIII wrote "It is, then, natural and worthy that as the Blessed Joseph ministered to all the needs of the family at Nazareth and girt it about with his protection, he should now cover with the cloak of his heavenly patronage and defend the Church of Jesus Christ." 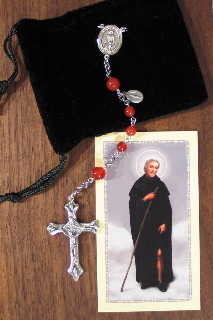 This rosary is suitable for fathers, grandfathers, and anyone with a devotion to St. Joseph. 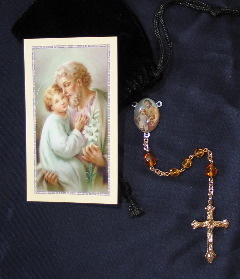 A Pouch and St. Joseph holy card are included. Knights of Columbus Rosary: We used to carry parts so that you could make Knights of Columbus rosaries. These parts were purchased through legitimate sources, at the request of various Knights or people who wanted to make a special gift for a Knight. However, without any warning or discussion, in February of 2009 the Knights of Columbus threatened to sue us if we didn't stop doing so and immediately comply with a variety of demands. Among other things, they falsely claimed that we were using the Knights of Columbus to promote and market our own business, that we were engaging in unfair competition with them, and that we were harming them. Click here for details. Lourdes Rosary: Lourdes, France, 1856. Young Bernadette was walking in the mountains when Mother Mary appeared to her. The miracles surrounding Lourdes and the spring of water found there have been a source of inspiration throughout the world. This strong flexwire rosary will call to mind the love Mary has for the most humble of her children. The colorful center pictures Bernadette and Mary. The crucifix contains genuine holy water from the fountain at Lourdes and is stamped "LOURDES" on the back. A black pouch is included for safe keeping along with a gold-gilt Lourdes holy card. Medjugorje Rosary: Our Lady comes, even today, to tell us God's love for us. Her message: "Pray, pray, pray!" 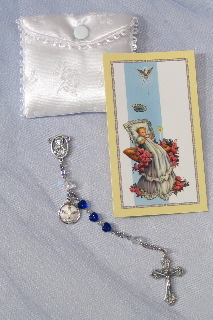 Our Medjugorje rosary features the image of Our Lady of Medjugorje on the center, pale blue glass beads, silver plate crucifix, a Medjugorje holy card and pouch. St. 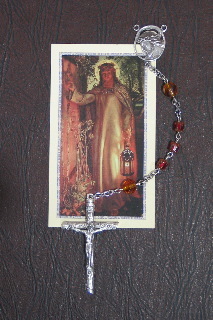 Peregrine Rosary: St. Peregrine was a brother in the Servite order who was diagnosed with cancer at the age of 60. Following his prayers at the foot of the cross, he was miraculously healed. In times of illness and pain, Peregrine is a friend who knows our struggles and spurs us on to humble prayer and faithful service to God. A lovely gift for the friend or loved one who is infirm. The red-orange carnelian beads are meant to evoke warmth and comfort. Black pouch and St. Peregrine holy card are included. Risen Christ Rosary: "He is not here. He is risen!" Celebrate the glorious mysteries with our unique rosary. Blue fossil beads remind us of heaven, our true home. The Our Father beads are white porcelain with blue flowers. 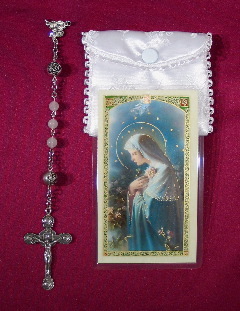 Holy card and pouch are included with your rosary. Sacred Heart Rosary: "Through Thy Wounded Heart, dearest Lord, pierce my heart so deeply with the dart of Thy love that it may no longer be able to contain earthly things but may be governed by the action of Thy Divinity alone." - St. Gertrude, 13th century. Saints throughout the ages have been drawn to heaven by devotion to the sacred heart of Jesus. Keep the image of the sacred heart before you with this rosary. Beads are smooth red glass to remind you of His precious blood. 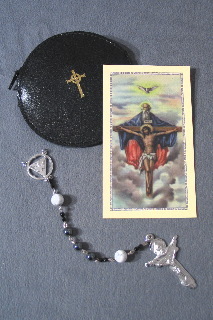 A black pouch and Sacred Heart holy card are included. San Damiano Rosary: This detailed icon from the 12th century is a bold statement of faith in the crucified Lord who is shown surrounded by the angels and saints. It was a favorite crucifix of St. Francis of Assisi, and his blessing is inscribed on the back. Paired with golden brown tiger eye beads and a Holy Spirit center, it is a strong reminder to prayer. Black flocked pouch and San Damiano holy card are included. St. Theresa Rosary: "I have never given the good God anything but love, and it is with love that He will repay. After my death, I will let fall a shower of roses. I will spend my heaven in doing good upon earth. My 'little way' is the way of spiritual childhood, the way of trust and absolute self-surrender." It is no wonder that St. Therese of Lisieux is so dearly loved. May we follow her example. This rosary has a colorful St. Theresa center medal and beautifully scented sandalwood Our Father beads. Comes with a St. Theresa holy card and pouch. Vatican Rosary: This rosary was designed for its strength and originality. Central to its design are a Holy Spirit center and the Papal crucifix. The blue fossil beads contrast beautifully with tiger eye beads and gold-plated chain. A weighty rosary for calling to mind the mysteries of faith. Black flocked pouch and holy card are included. More popular kits can be found here.